Hey fellas, the PM means well but knows bugger all about Pesach. Since when Pessach is a “universal day “. What ,do the French, Germans , Spanish or……the so called Palestinians celebrate Pessach or give a toss about it !!!??? Ms Gillard you are, most definitely, funny !!! I really wonder who writes her stuff. Yes Shirlee dear, I agree with you and also I agree with meself. Is this the same person who calls a General Election on Yom Kippur; thus disenfranchising all observant Jews and prevents them for doing any political work at election time? I’m afraid her ‘best wishes’ leave a sour taste in one’s mouth. What an insult! Pesach is not a universal tale of Liberation. It is a Jewish tale of Nationalism. We have Rosh Hashana to connect Judaism to universal ideals. 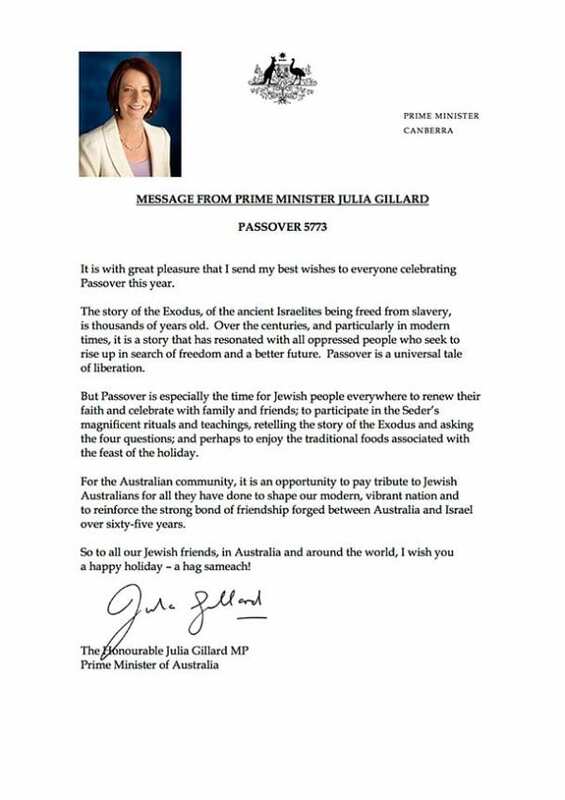 It’s nice for our PM to pontificate about how to observe Pesach, but I don’t tell her how to celebrate her festivals. As for the bond of friendship with Israel, maybe she didn’t notice that Bob Carr has just called the united capital of the Jewish people and our holy Beit Hamikdash illegally occupied territory. A bit early for Pesach greetings, but then again she may think she better do it while she is still PM.